So my crane is a little rusty and has a few oil leaks, cracked windows and yes, some missing. 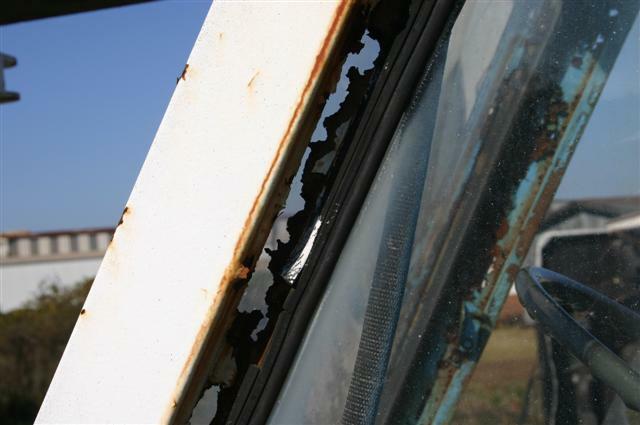 But then I don't need AC. 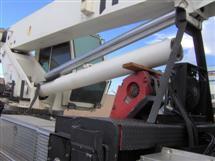 So what if the boom does not come in all the way, controls are not marked. 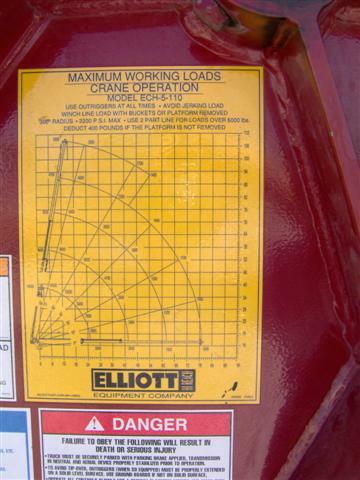 It keeps all you crane operators out of my very own seat. 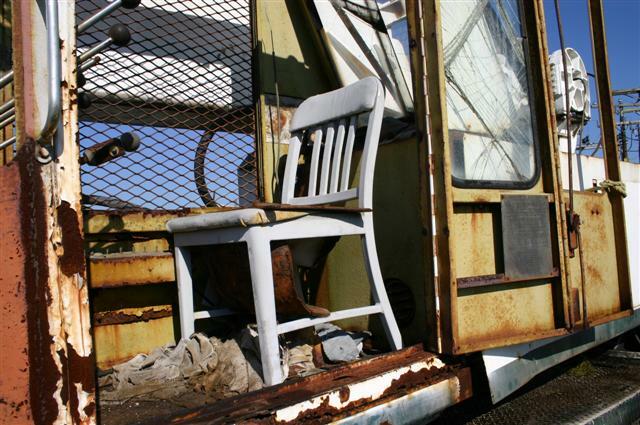 If you have to work all day long you might as well have a chair a chair you want. 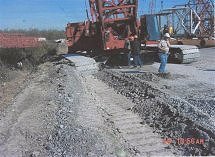 These tracks were made for walking on firm level ground! 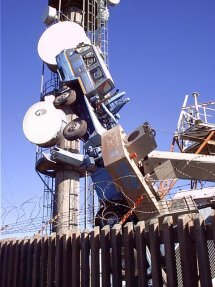 Oops, I didn’t do that! 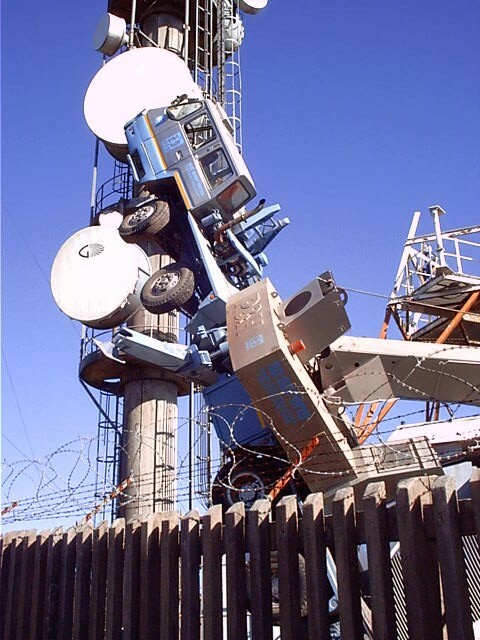 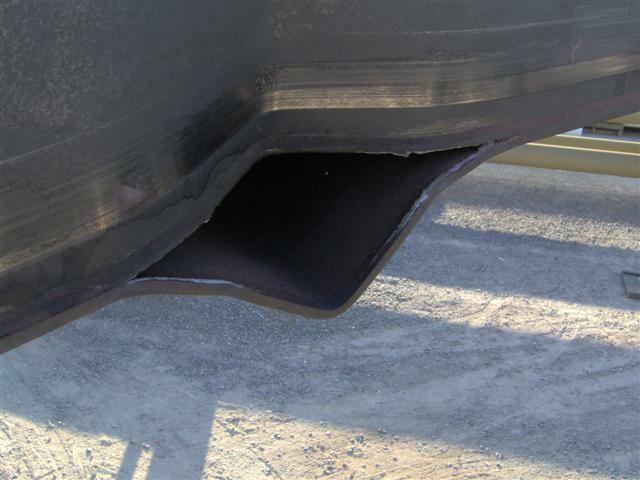 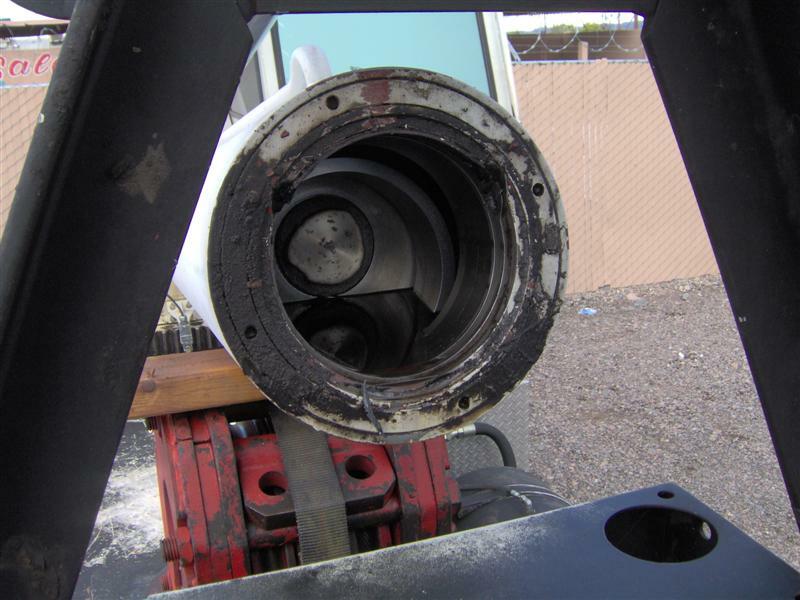 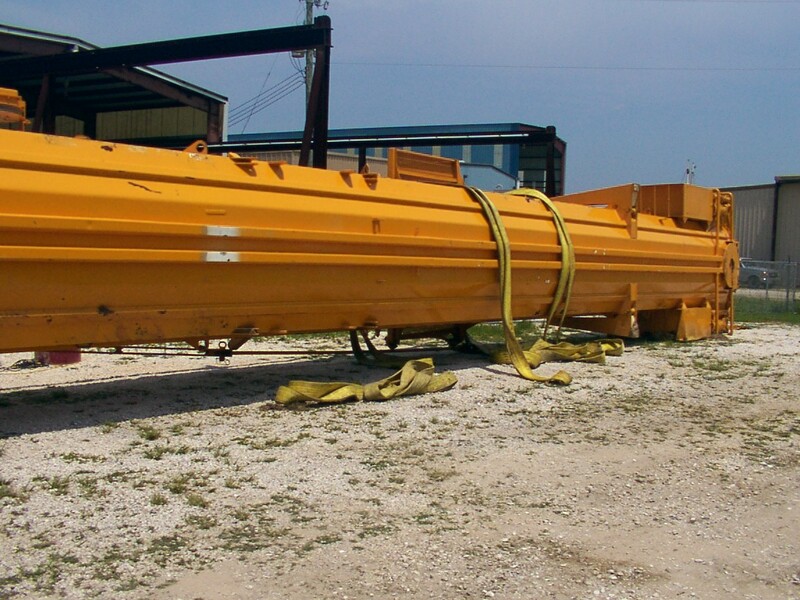 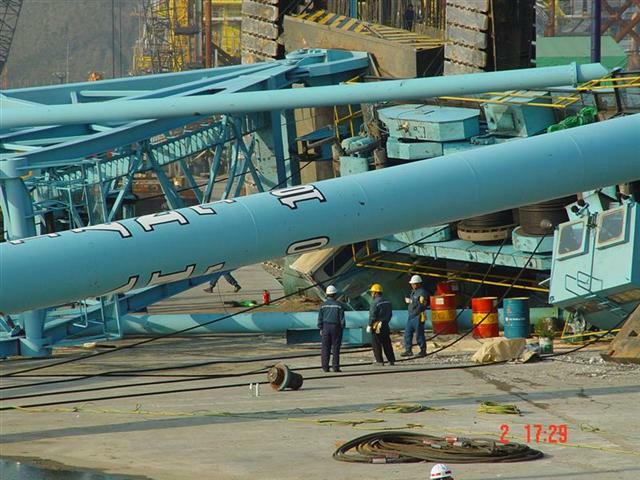 Crane was USTC 40 ton, rod blew out end, boom fell on barrel so it never hit the ground (boom extended all the way). 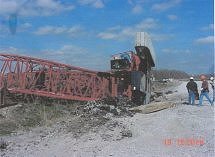 Has any one seen anything like this please e-mail me if you have. 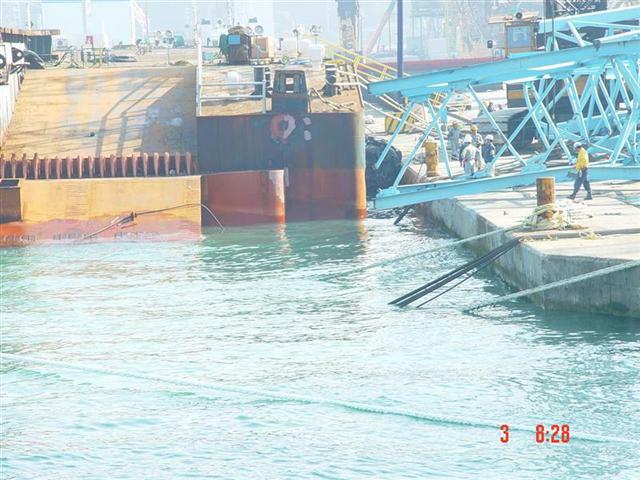 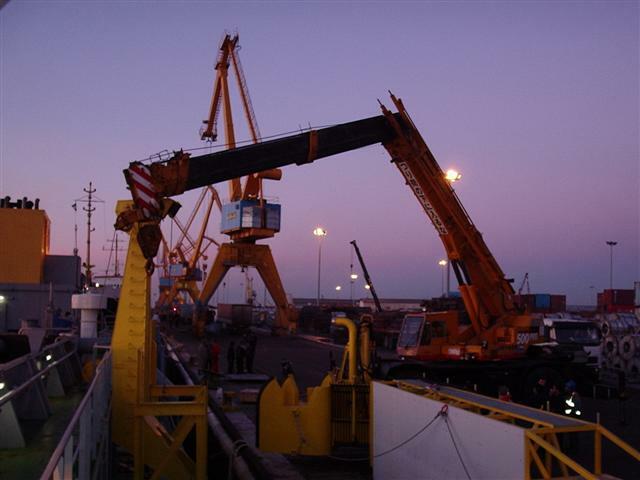 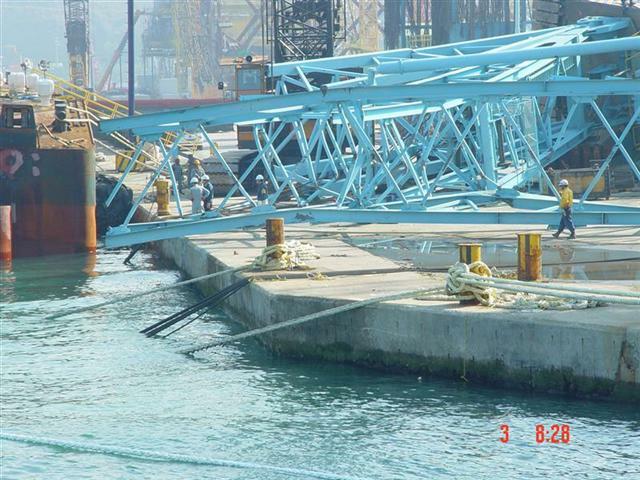 This accident happened in Port Anzali in Iran. 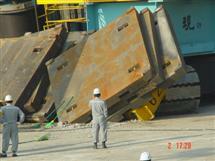 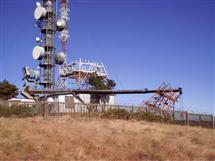 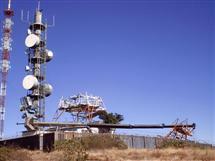 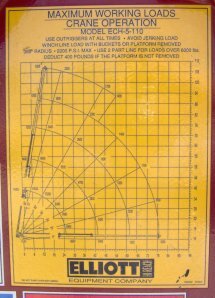 They had 2 sections extended, with boom angle at approx 62deg. load was 8000 lb, two part line on block, note platform deduction 400 lb. 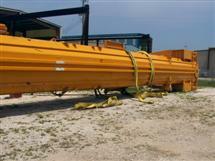 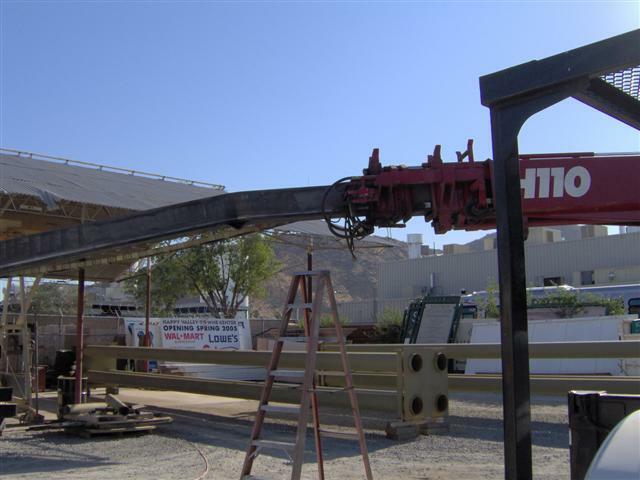 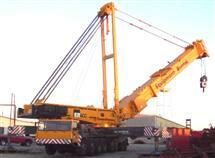 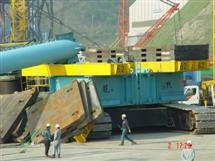 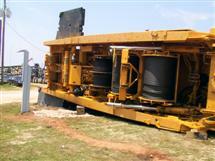 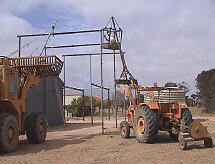 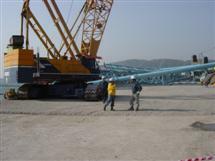 this put capacity of crane as set up at 2200 lb. 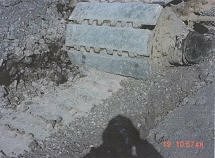 block 50 lb. 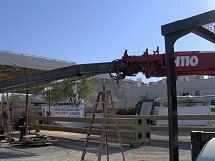 rigging--20 lb. load 8000 lb boom failed. 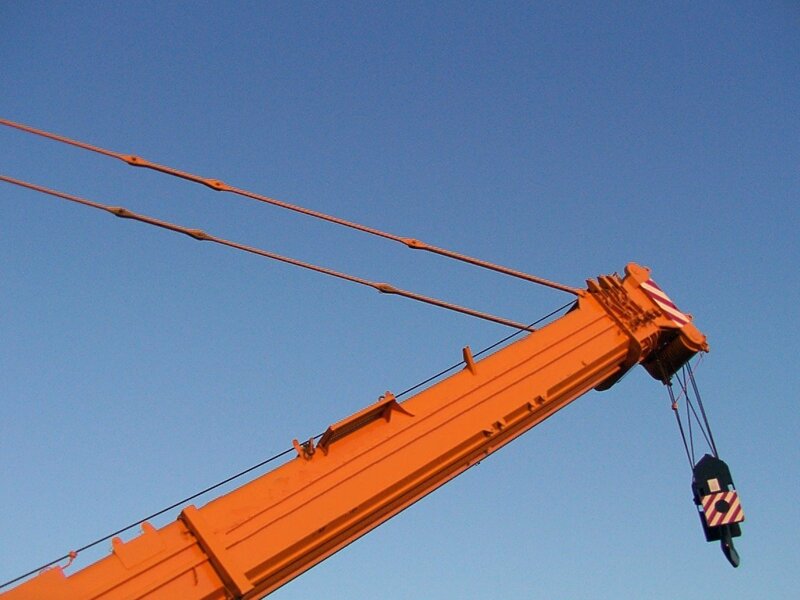 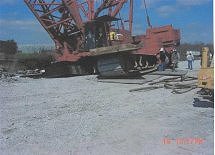 Photographs provided by: Brodek Crane Inspections, Inc.
"Riding the hook" by sitting in a sling and being lifted by a crane is a highly dangerous work practice and is illegal, as any trained and responsible crane operator should know. 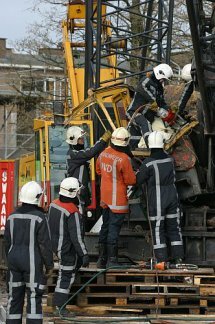 There are still people in the construction industry that either don't know or don't care about the most basic rules for site safety. 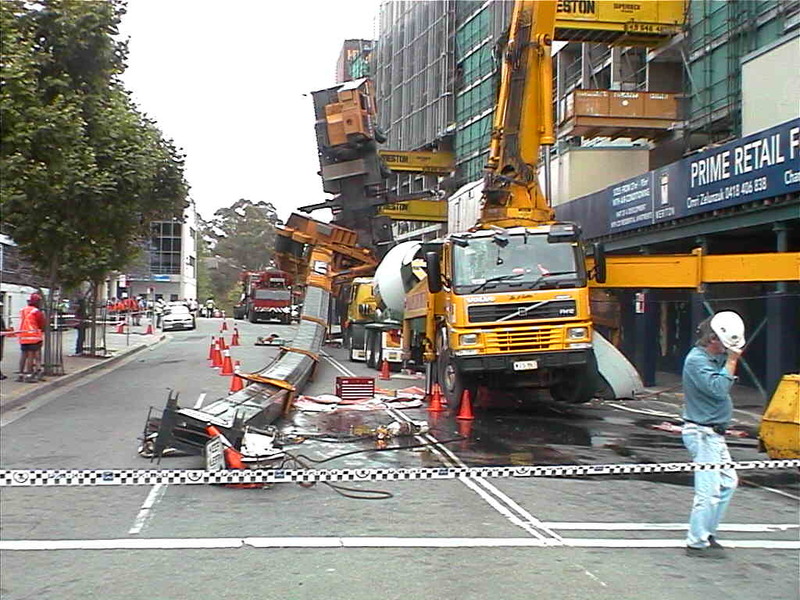 Small wonder the industry is still plagued by unacceptably high fatality and serious injury rates. 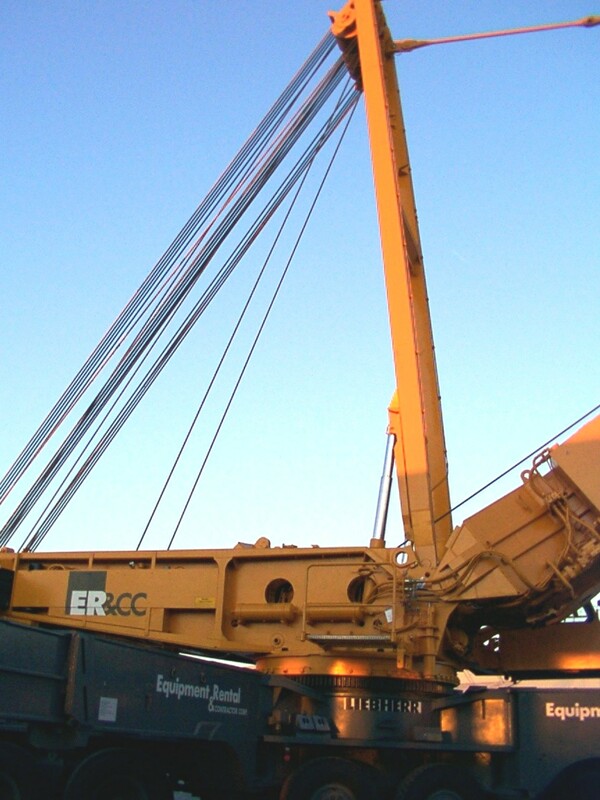 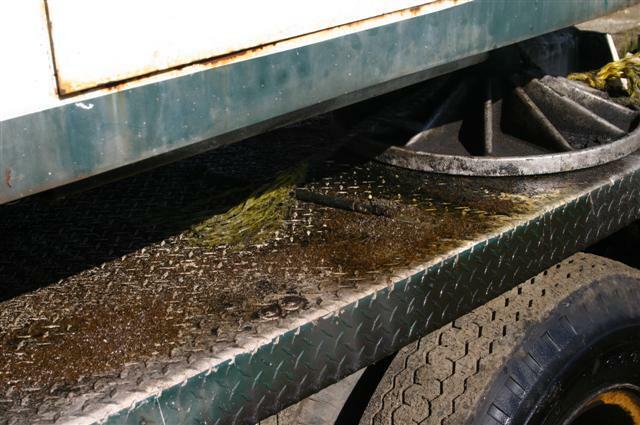 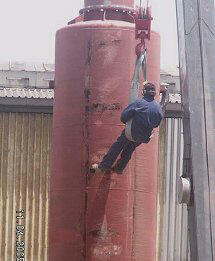 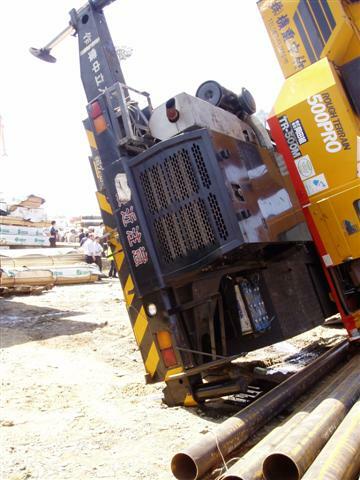 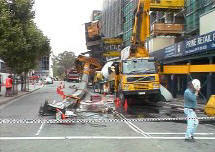 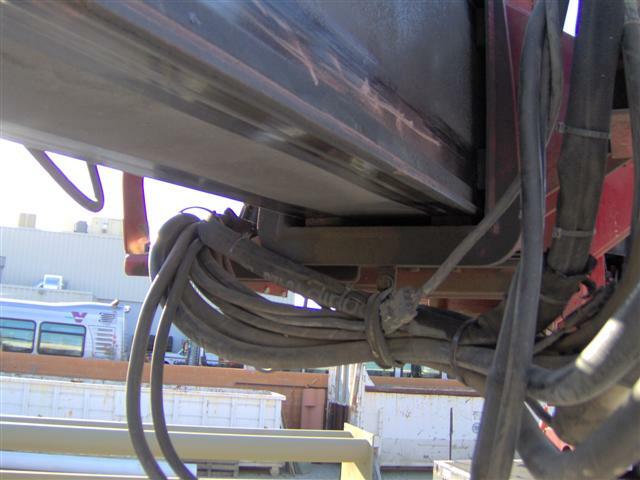 Many unsafe practices are performed by responsible crane operators due to the intimidation of supervisory management. 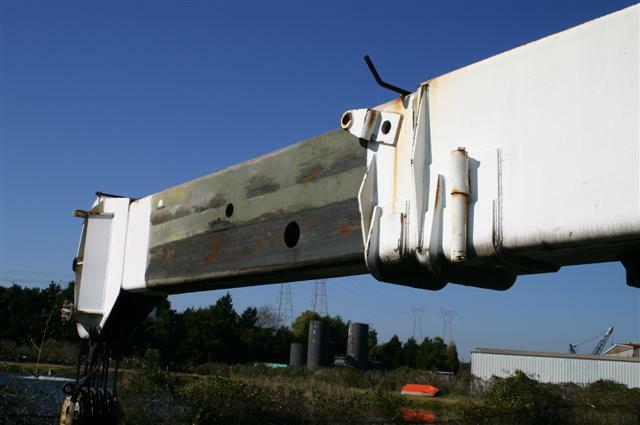 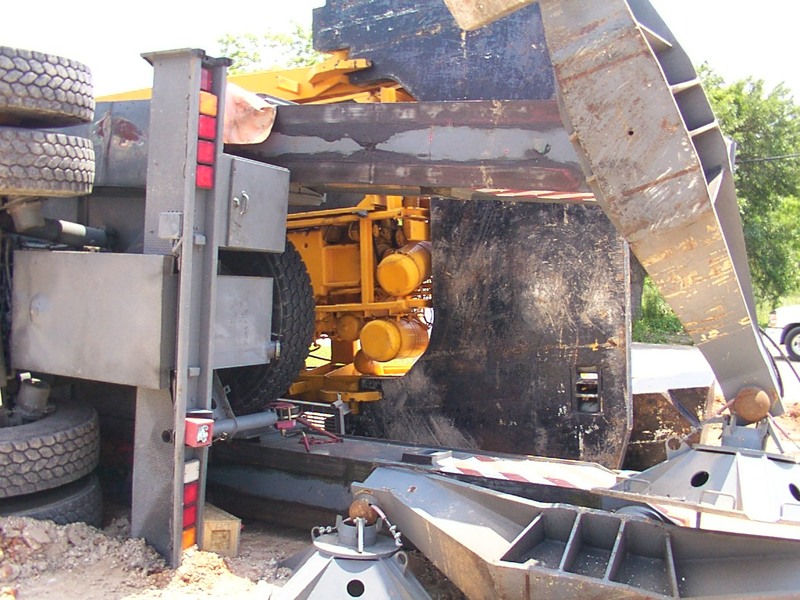 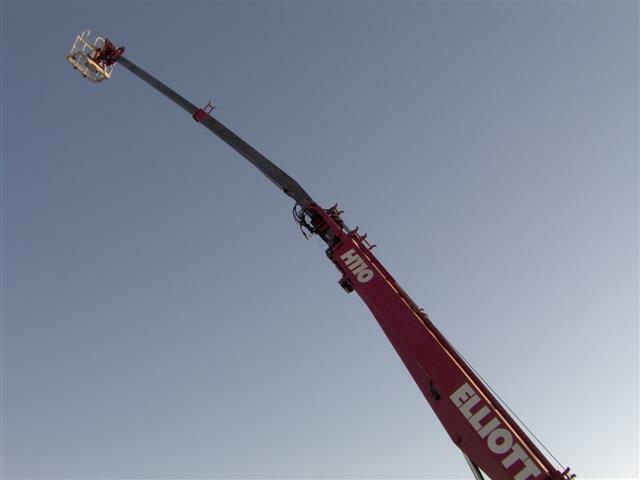 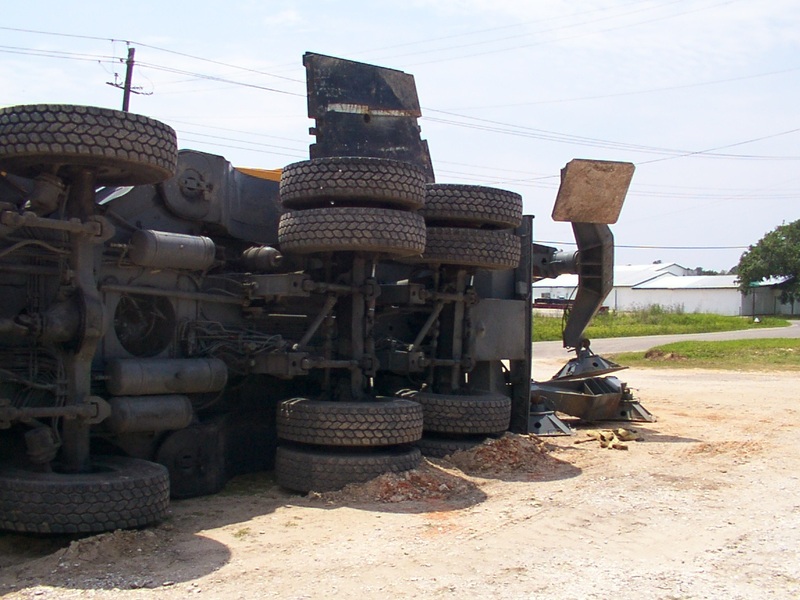 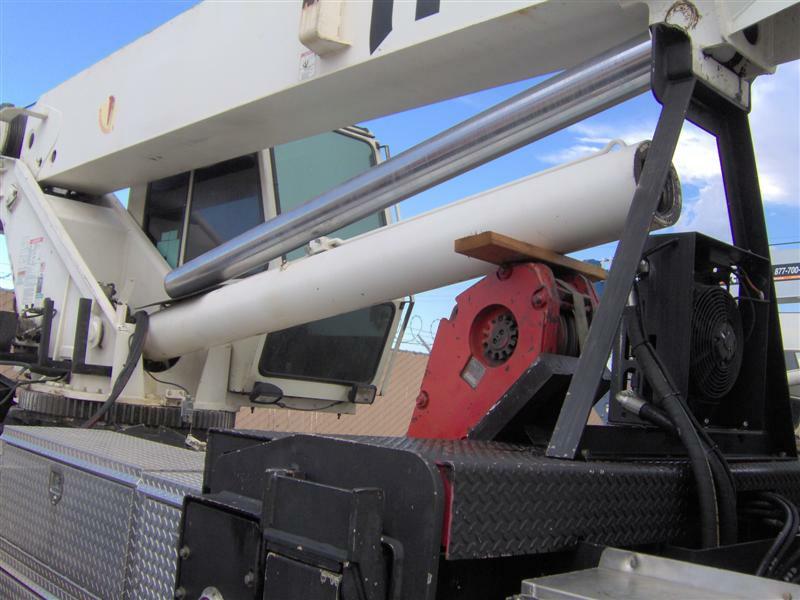 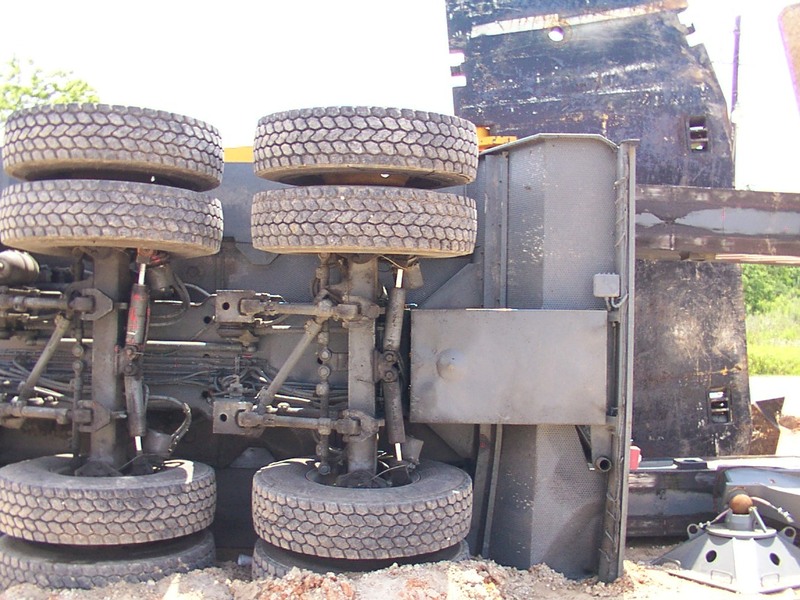 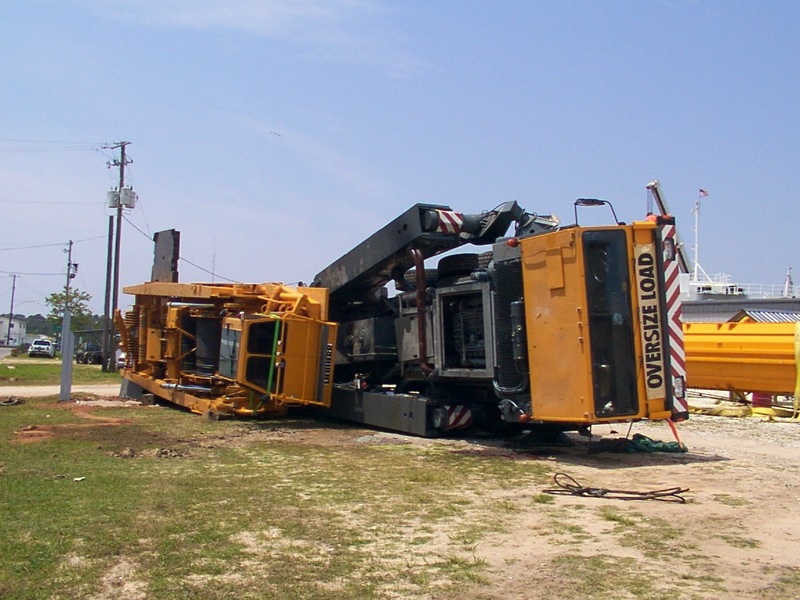 Unfortunately in the case of an accident the only person responsible will be the crane operator so it is imperative that crane operators realize the liability for unsafe operating procedures. 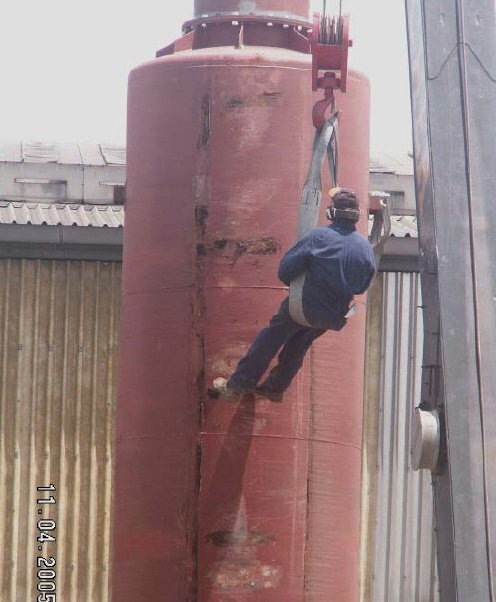 This would have to be one of the worst steel erection methods ever seen. 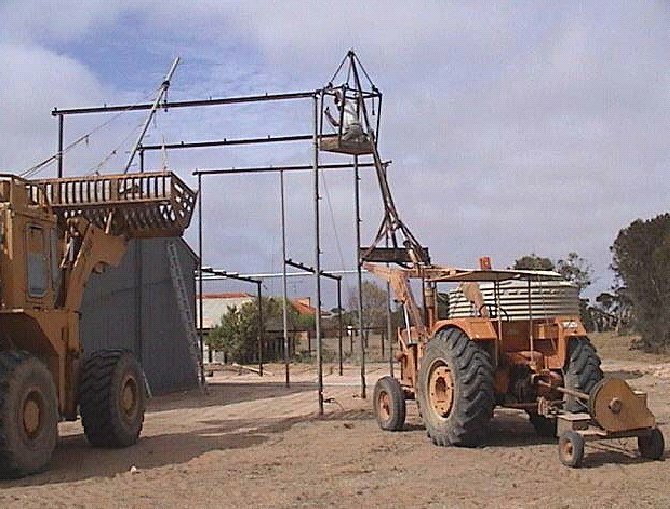 Instead of using mobile cranes, and a properly designed and constructed work box, these geniuses have made do with a couple of front-end loaders fitted with some jerry-rigged home-made attachments. 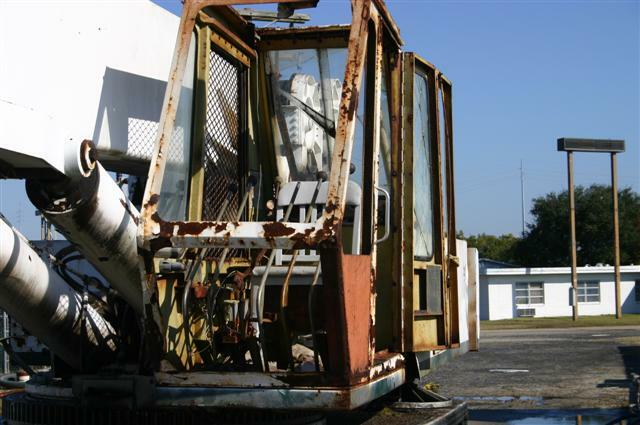 To make matters worse, there is only one operator for both machines. 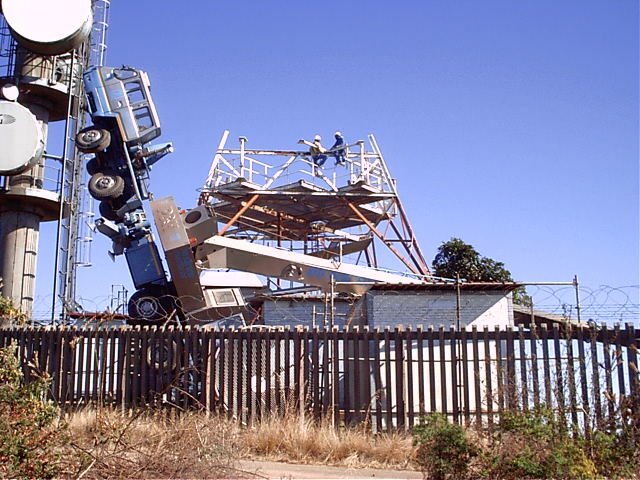 The result, as the photo shows, is that one machine has been left unattended while a man is precariously suspended from the totally inadequate work box and home-made fly jib. 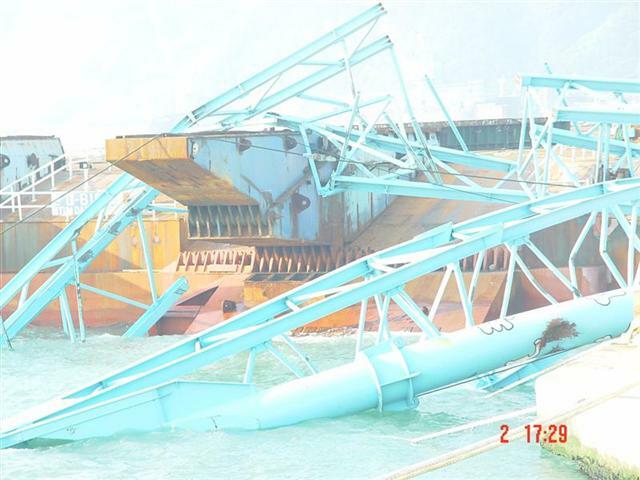 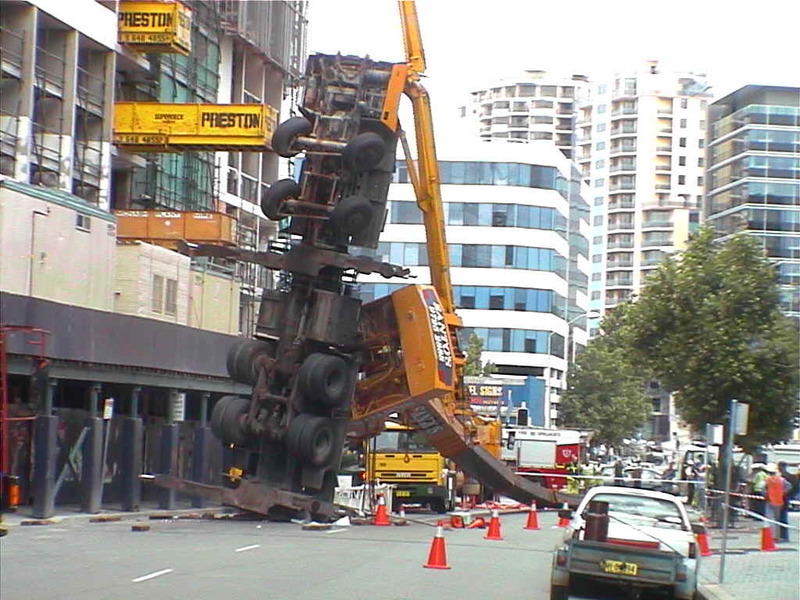 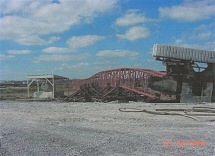 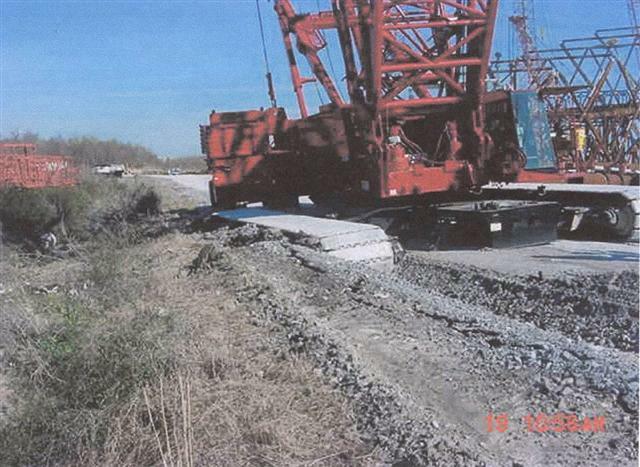 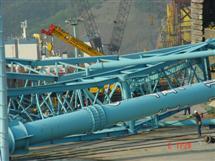 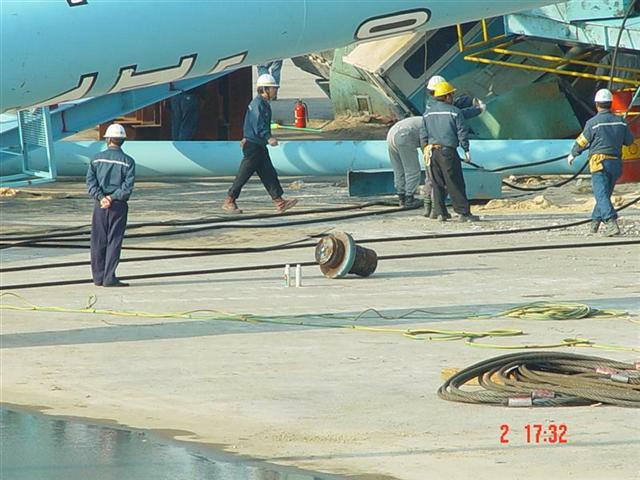 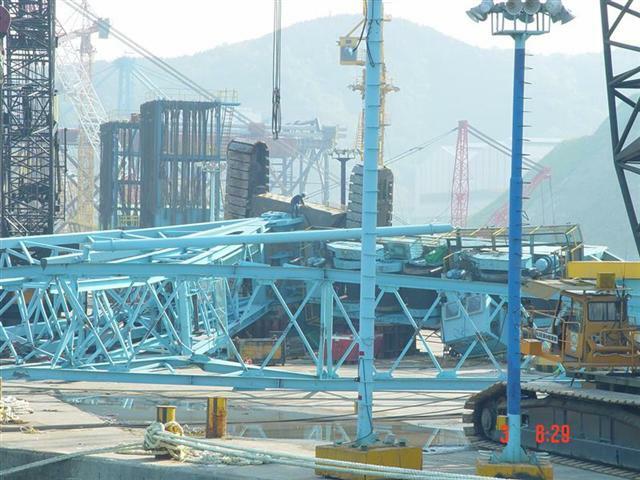 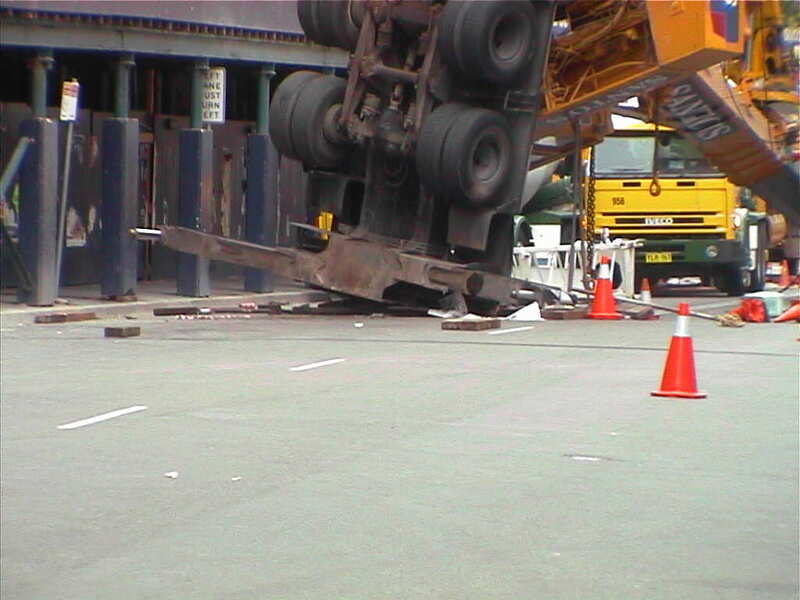 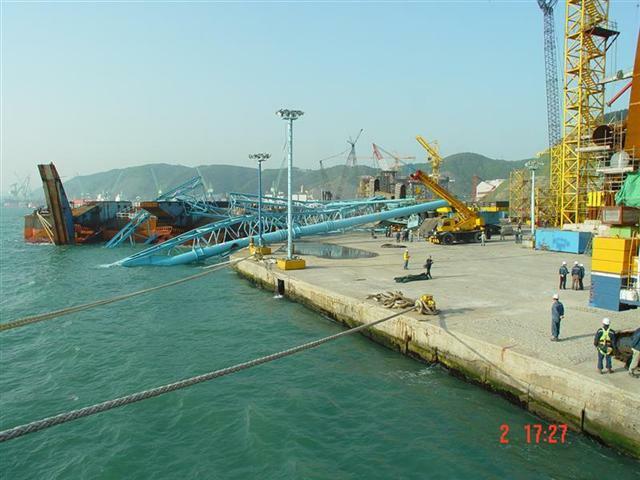 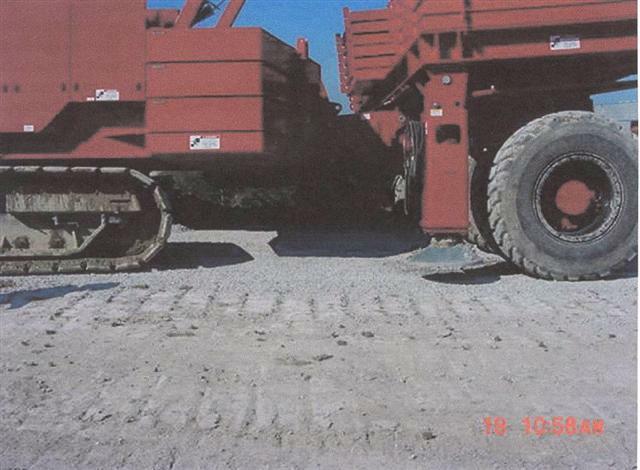 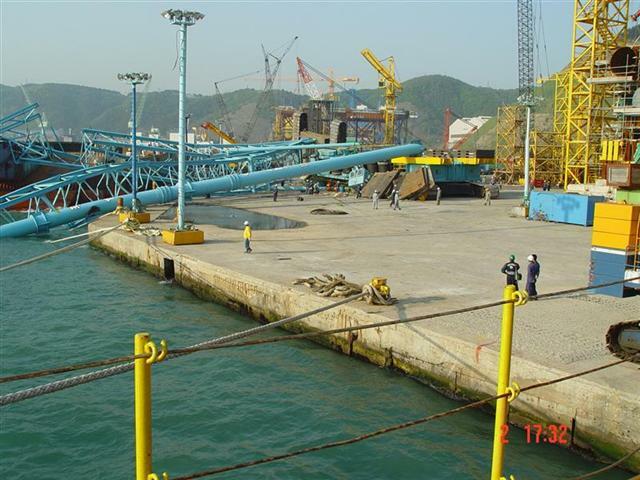 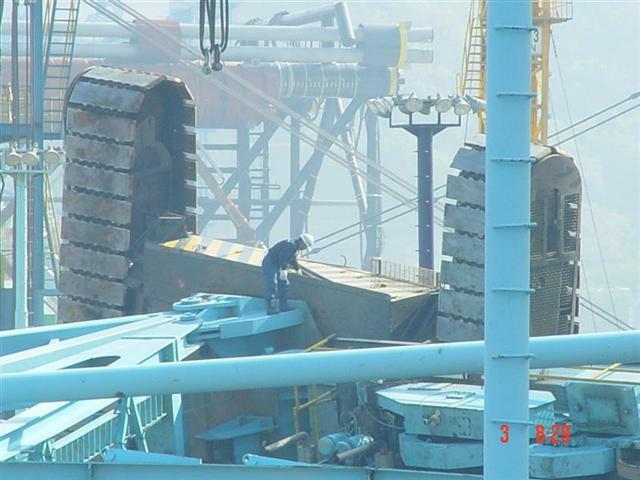 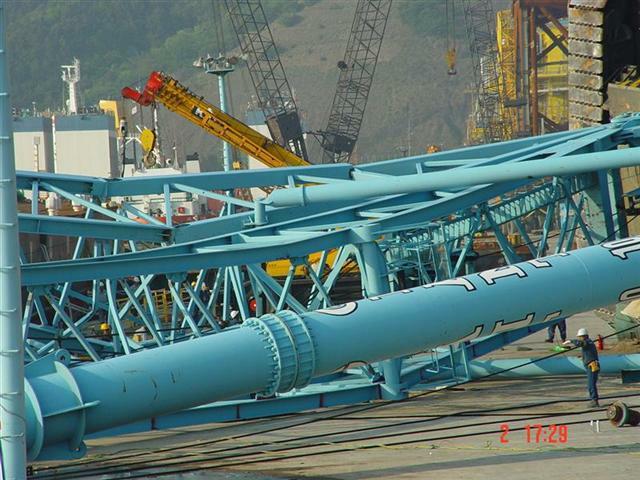 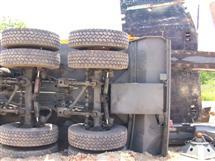 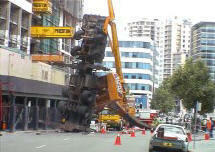 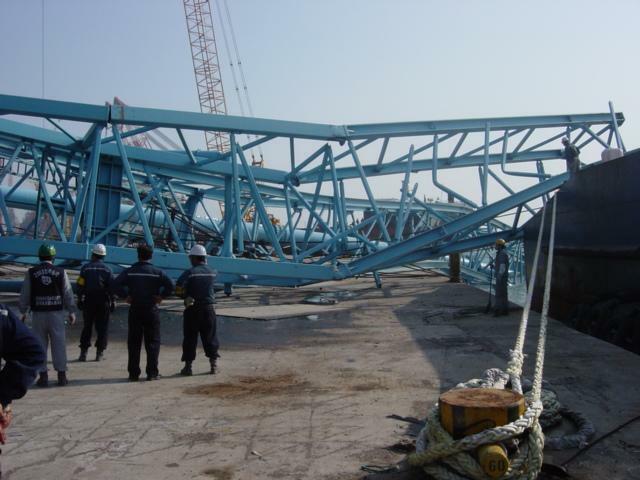 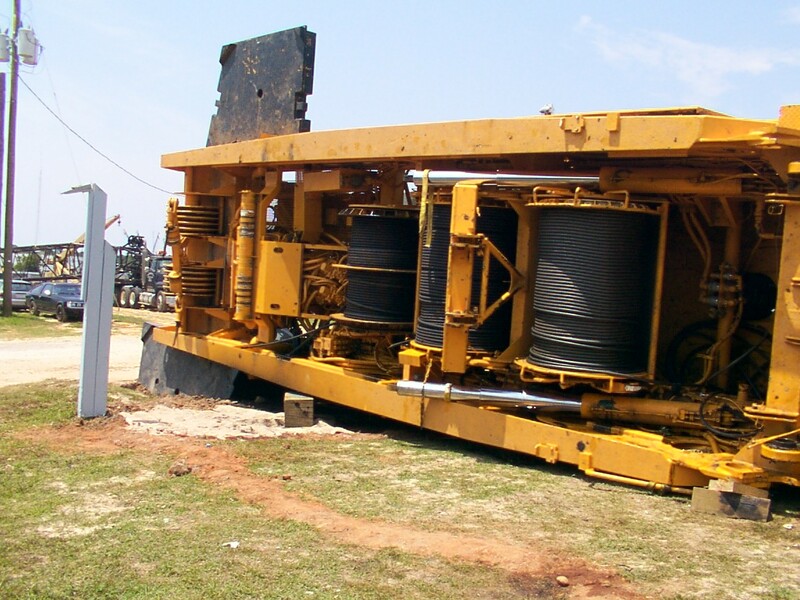 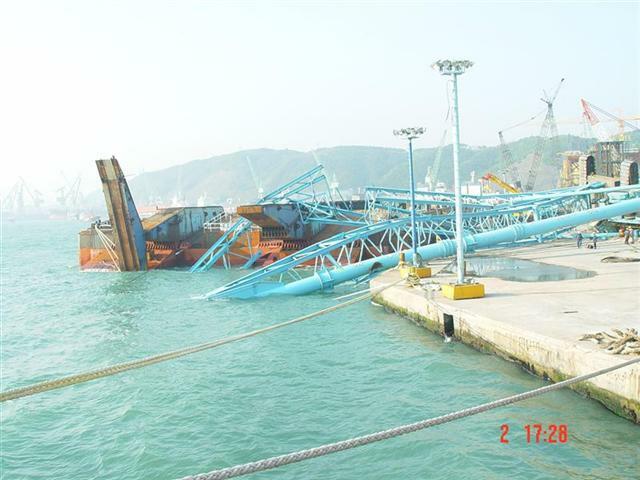 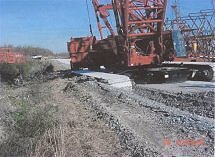 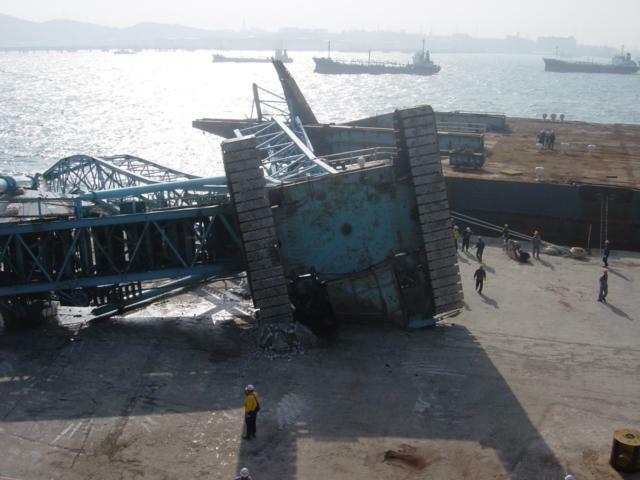 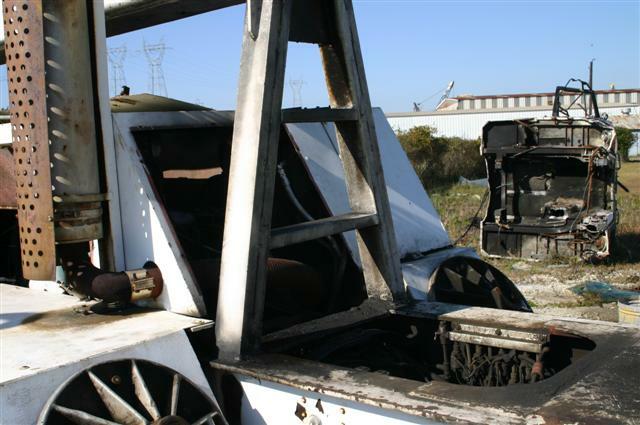 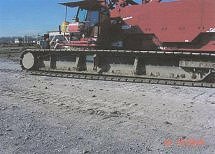 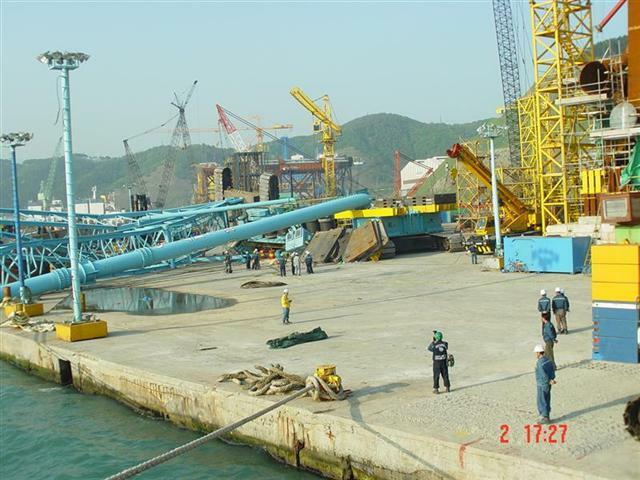 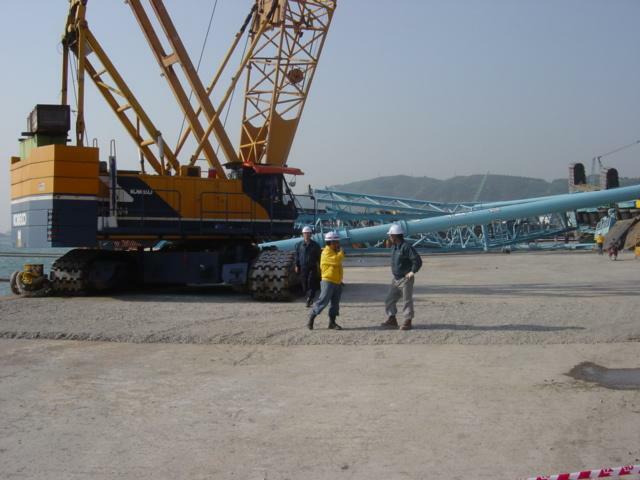 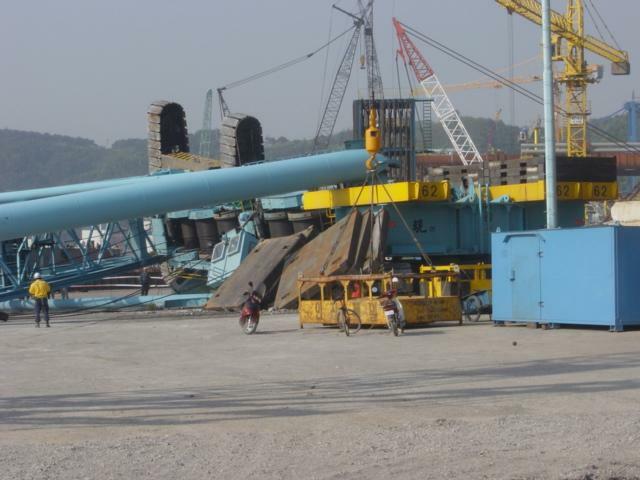 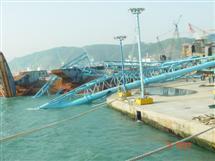 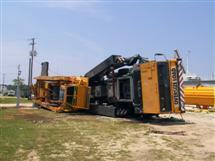 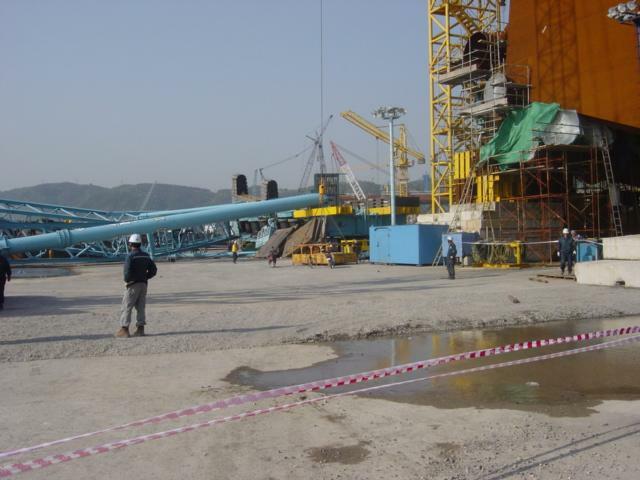 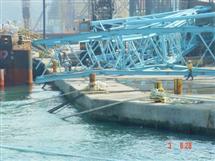 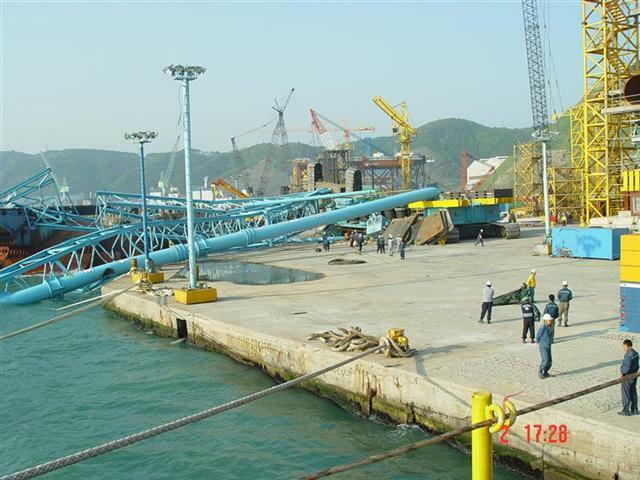 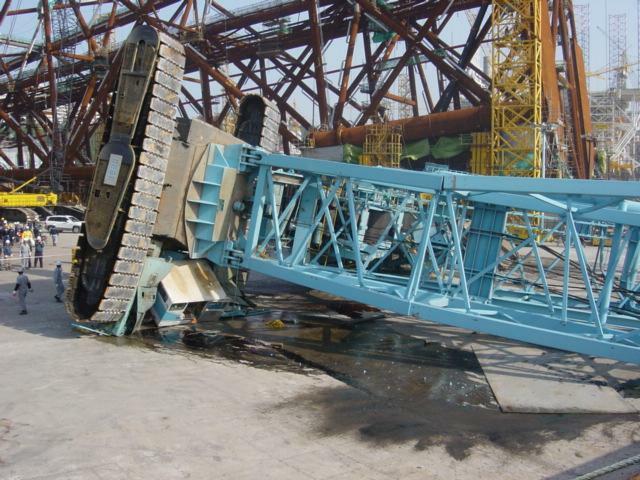 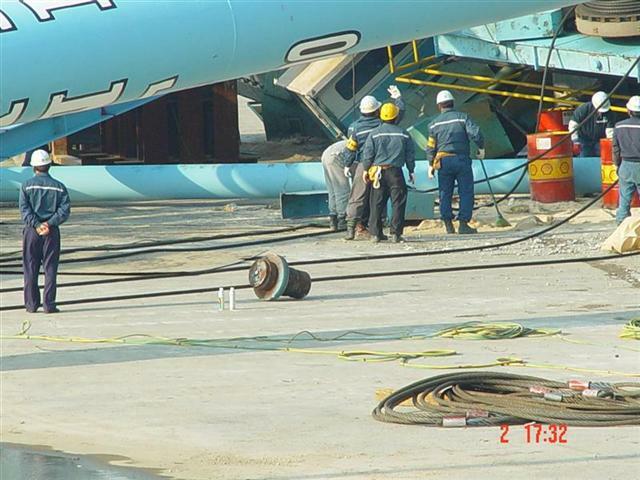 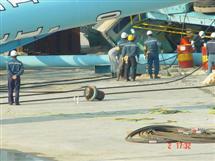 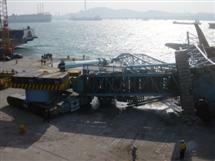 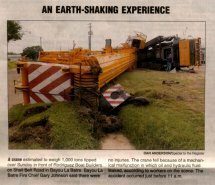 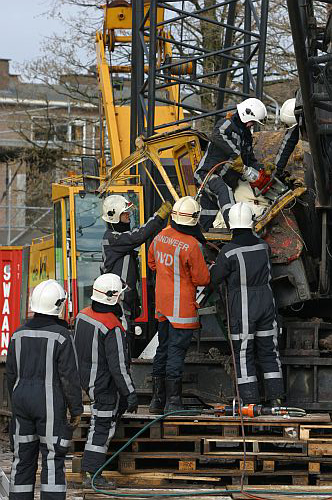 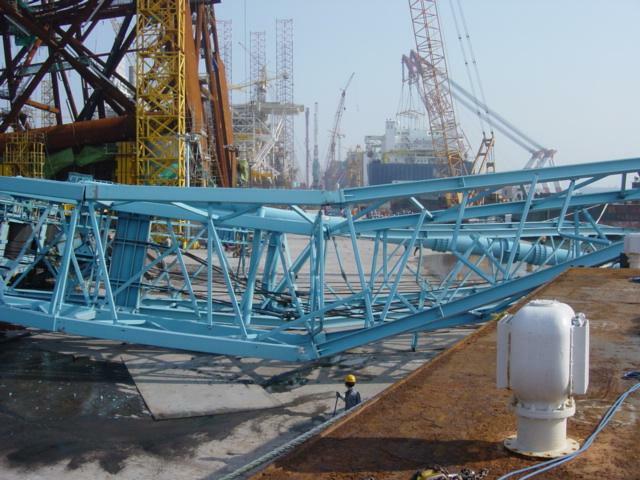 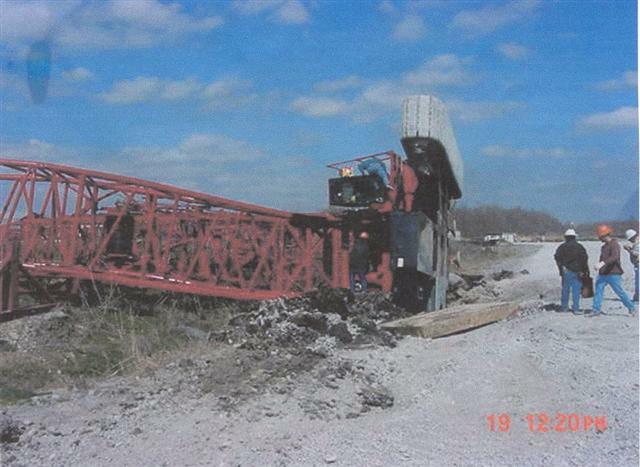 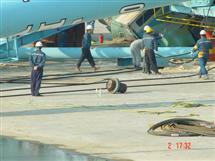 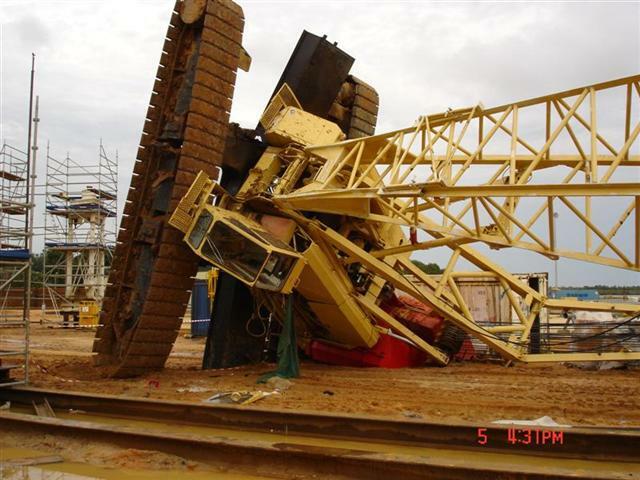 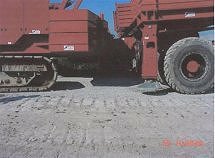 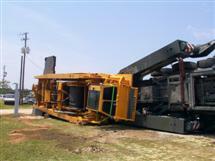 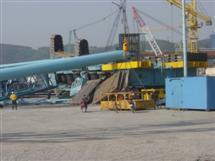 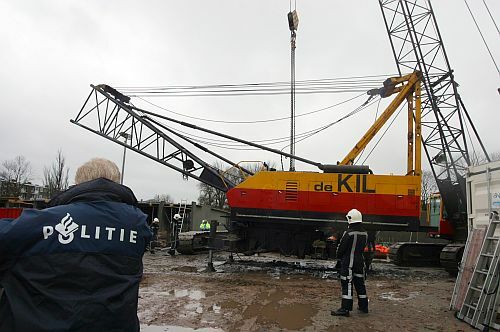 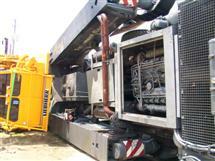 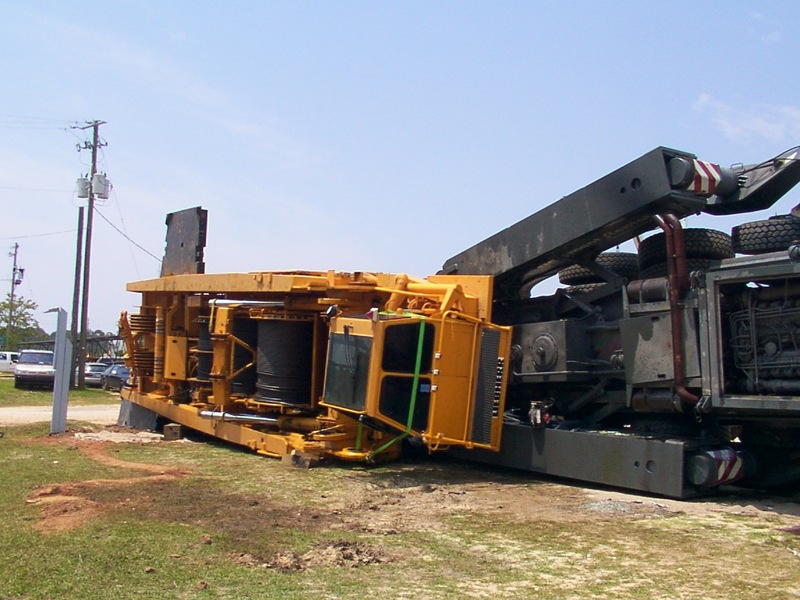 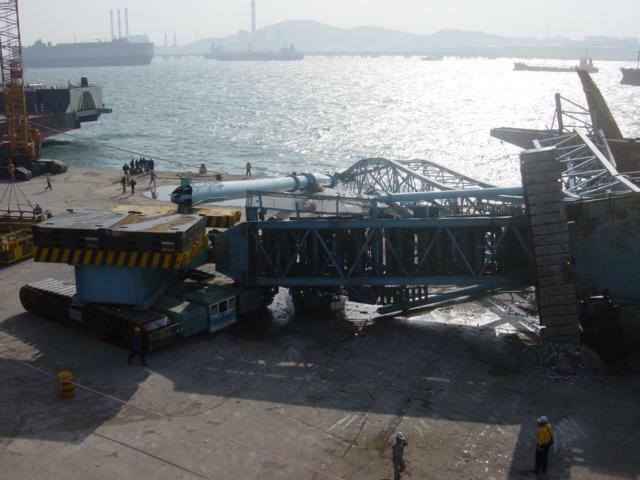 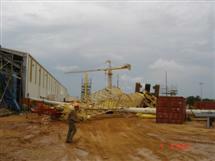 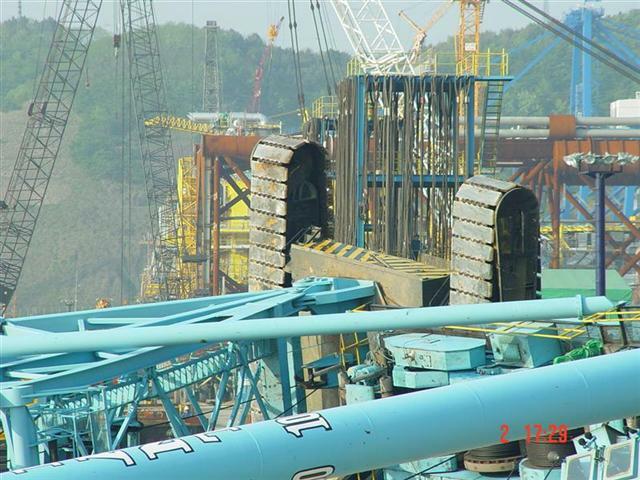 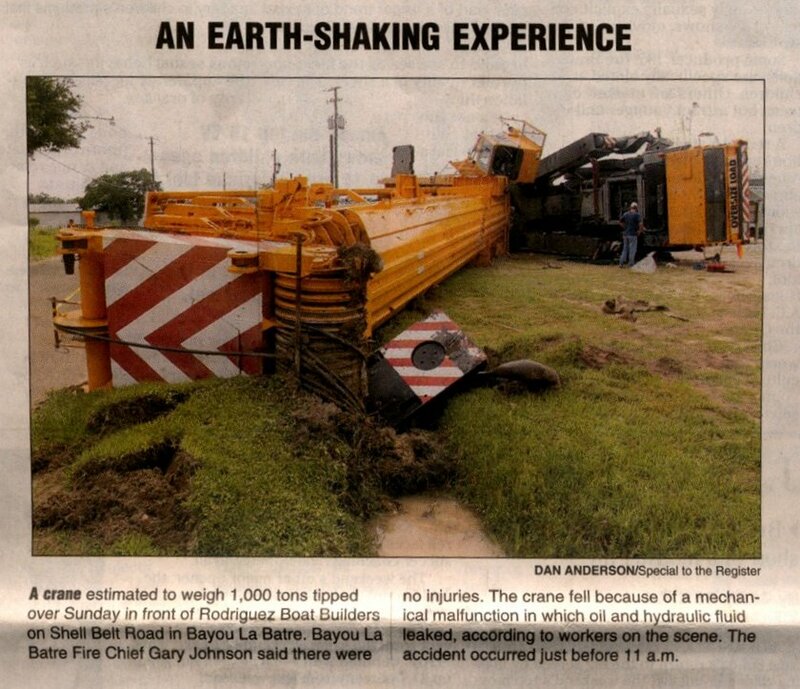 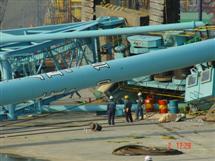 The following photos are of an accident on 05/15/05 with a 1000 Ton Hydraulic Boom Crane (Liebherr LTM 1800). 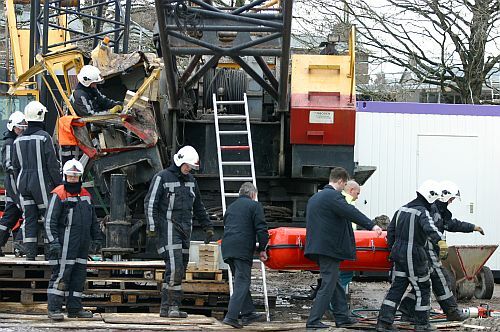 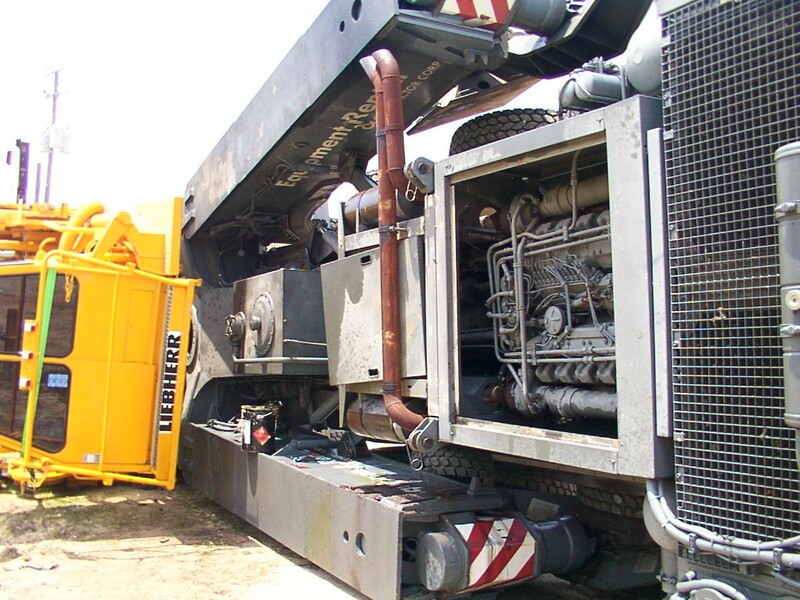 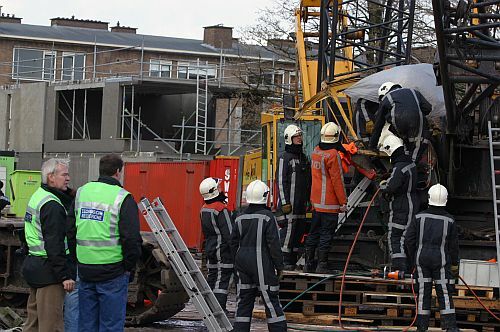 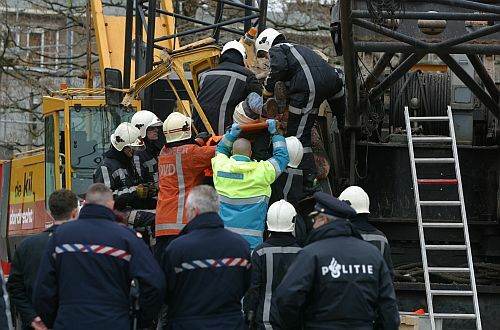 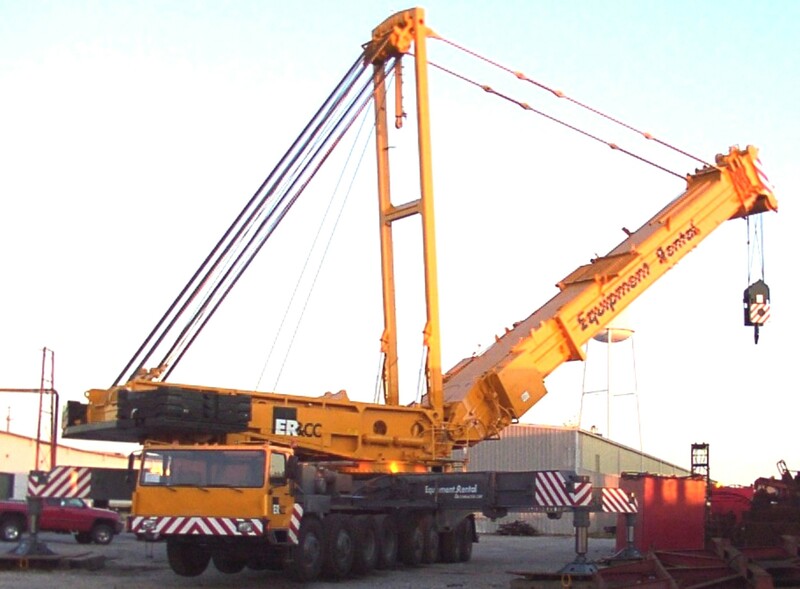 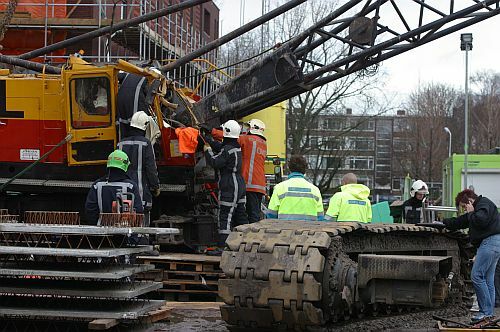 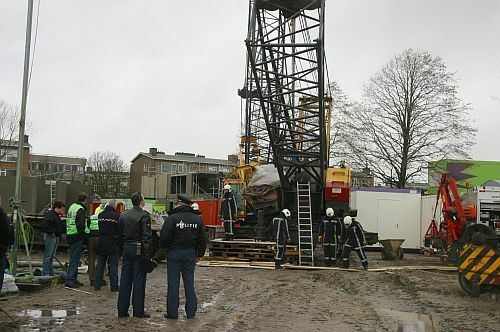 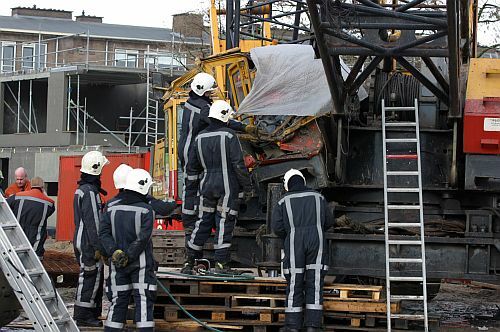 IMO after looking at the jobsite, the crane operator failed to lock the hydraulic suspension cylinders, as required for jobsite movement of almost all of the European all terrain manufactures (like Grove, Krupp, Liebherr, Demag and others) with the boom in the air. 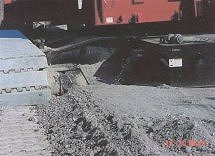 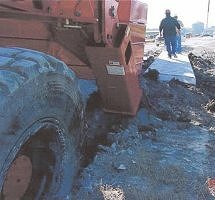 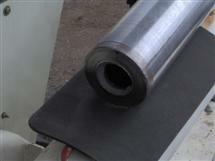 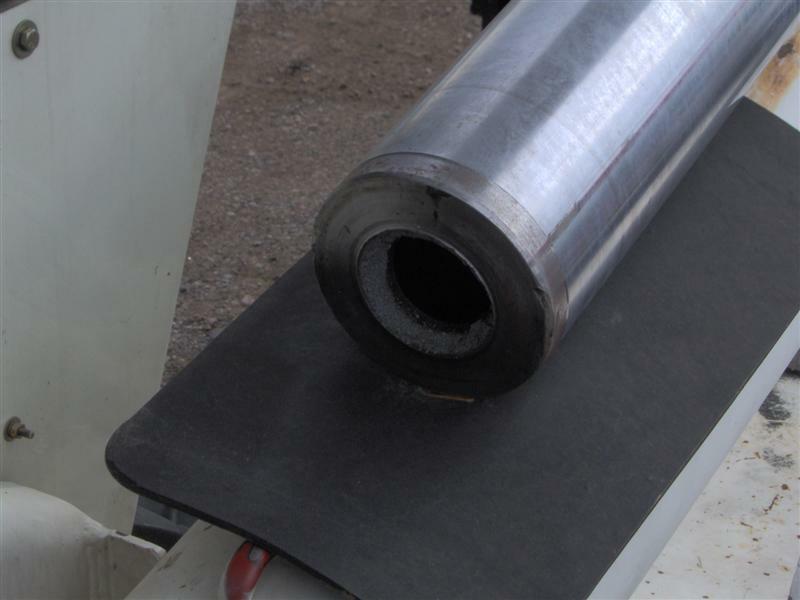 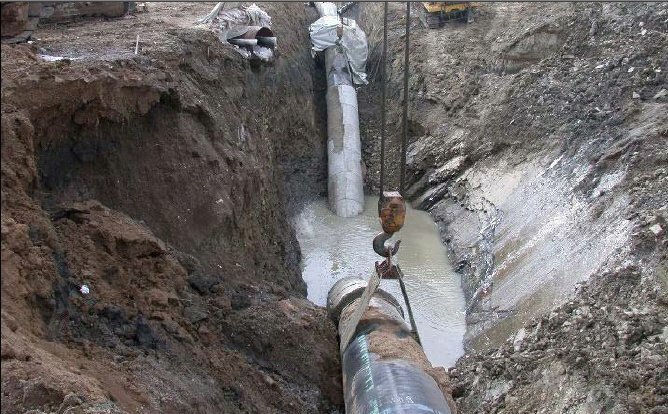 The job is to install a section of concrete-coated 42" pipe under a small river bed. 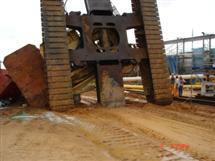 The river has been diverted and the trench is 8 meters deep at the lowest point. 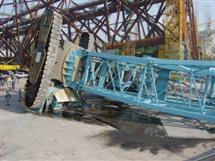 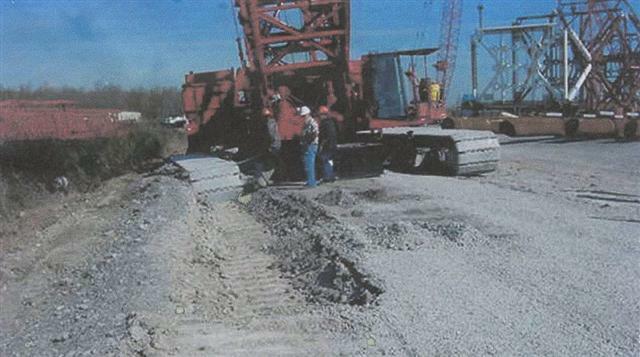 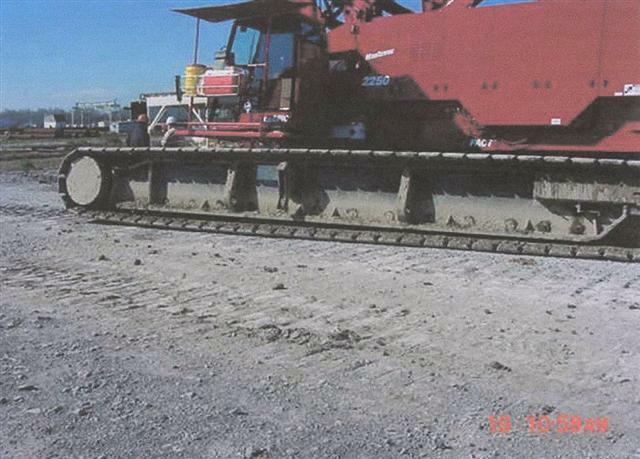 The crane is standing on what is normally the river bed, which can be seen to be loose shingle and already collapsing under the combined weight of the machine and pipe. 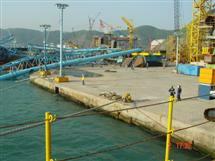 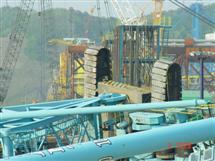 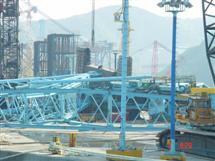 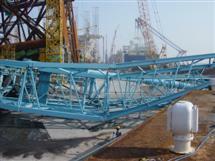 Gantry Crane from the Port of Pusan in Korea. 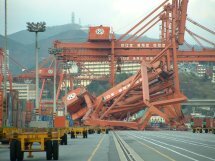 Its not a mishap in the true sense of the word as the damage was caused by a severe storm that passed over the port but just shows even things as big as the Gantry cranes don't stand a chance. 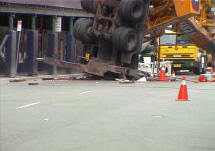 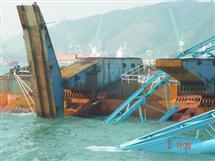 There were 5 other Gantry Cranes in similar condition. 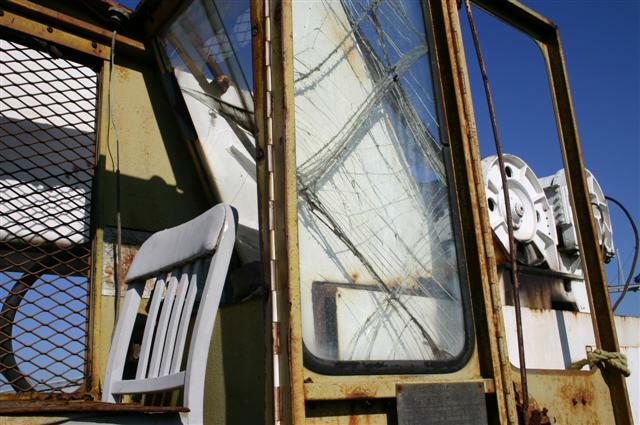 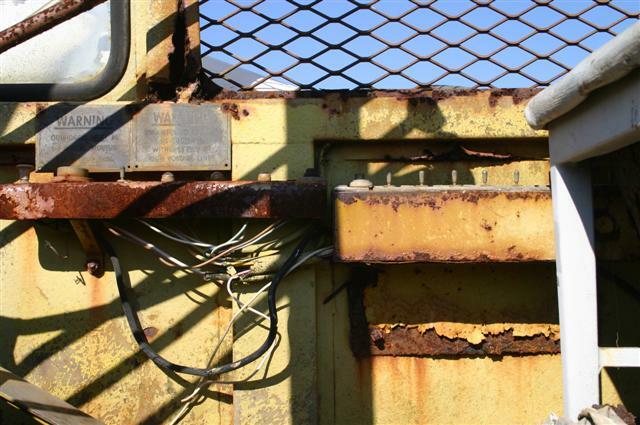 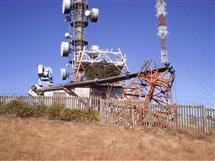 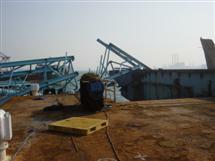 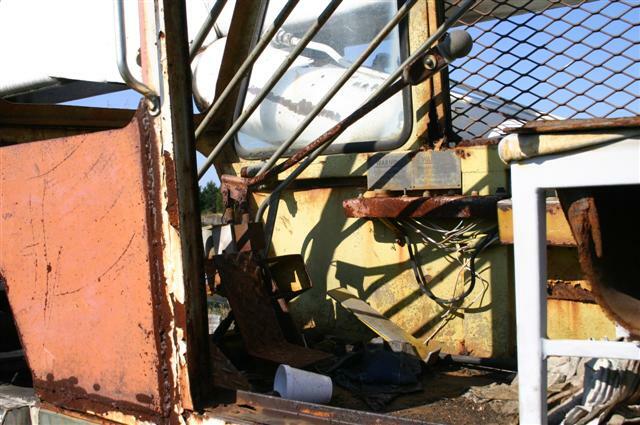 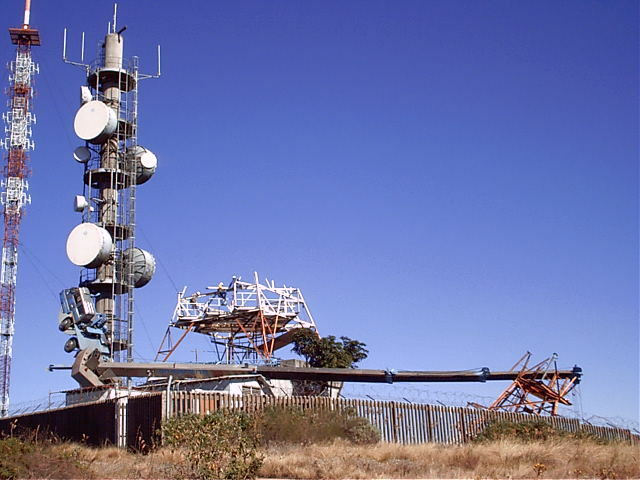 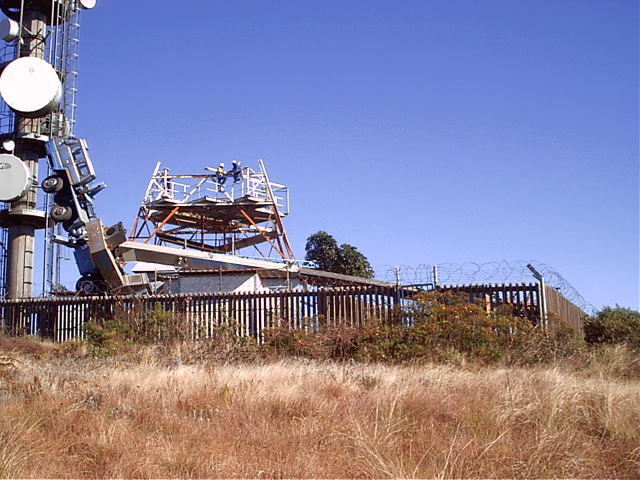 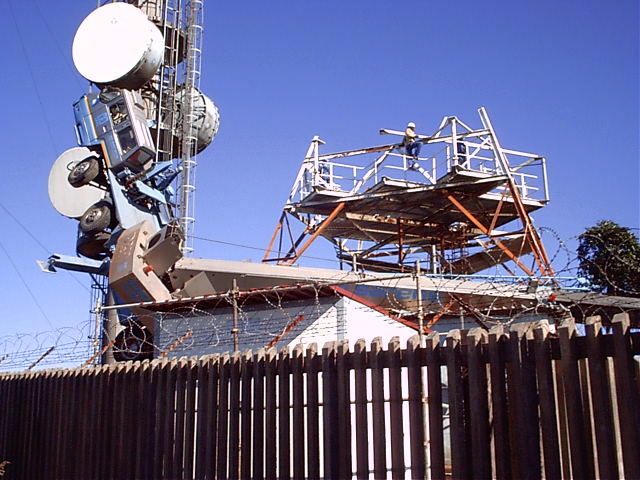 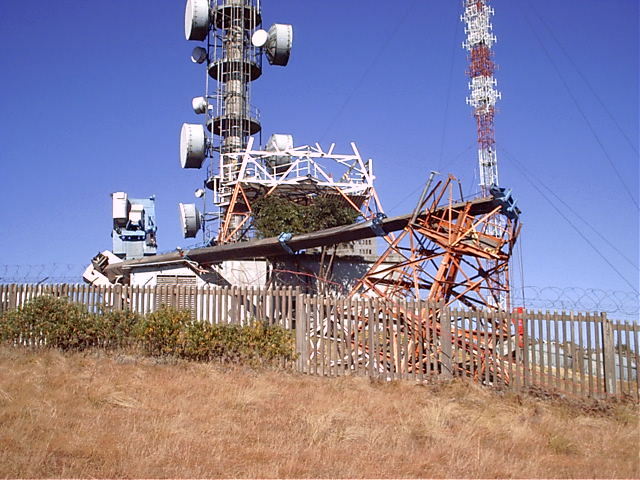 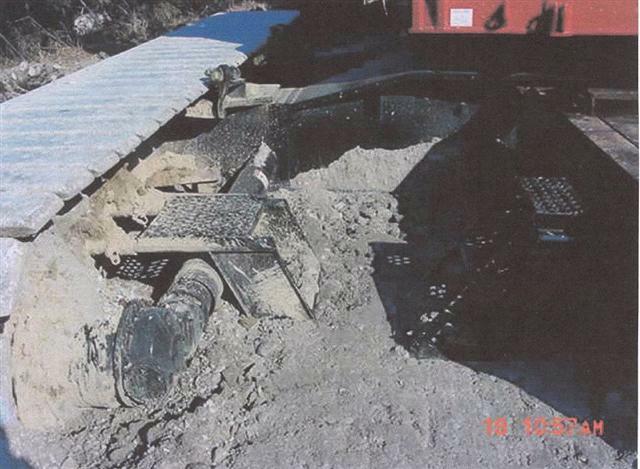 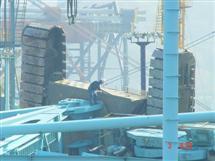 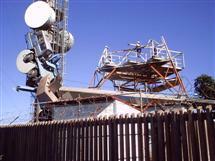 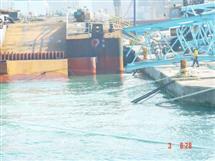 The crawler belt failed on the operator cabin (below) resulting in the death of the operator. 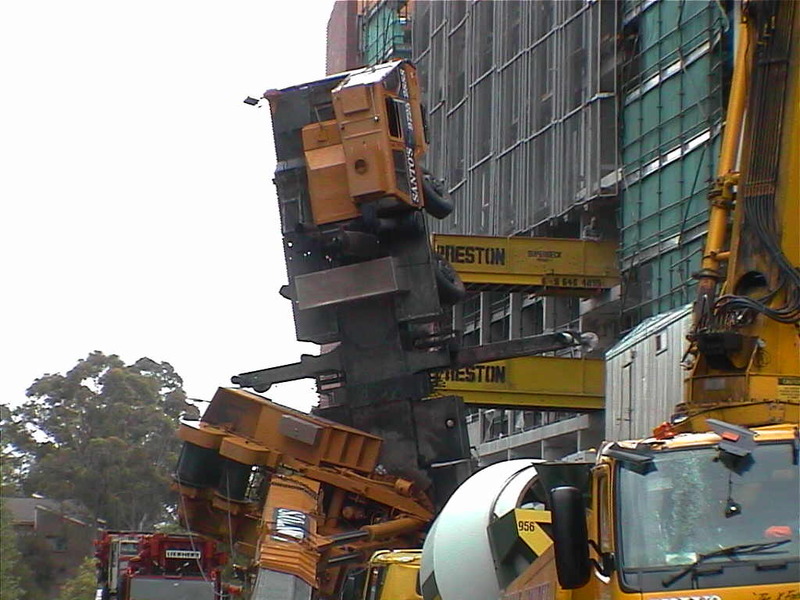 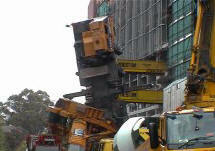 Gravity is always on the job pulling overloaded cranes to the ground.